I’m never super motivated to dress my house up in Valentine’s Day decor. We don’t do much to celebrate the holiday, but a little love reminder in the house is never a bad thing! Throughout the year, I periodically change out a frame that I have leaning on my bookshelf. 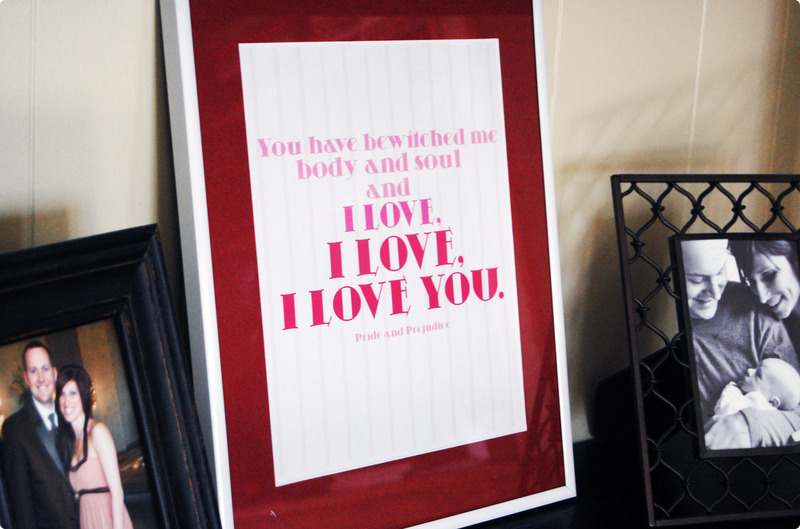 This year, I took a quote from one of my favorite classics, Pride and Prejudice by Jane Austen. And now you can have it too! Just click here to download a free PDF file of the print. You can print it at home on your computer and place it in a frame you have in the house. Or think about spray painting an old frame a pretty pink or red color. Home decor doesn’t come much cheaper than that! Wishing you love this Valentine’s Day!